World’s top kiteboard racers enjoy a packed day of competition on day one of the championship making its inaugural stop in China. Boao, Hainan – Reigning kiteboard racing world champions, Johnny Heineken and sister Erika, continued where they left off the at last year’s finals in Italy. The siblings proved they were the duo to beat, scoring bullets in all their races on the first day of competition at the course racing championships being hosted by China for the first time. 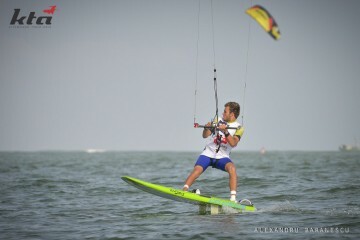 The riders from more than 40 countries enjoyed almost perfect conditions as winds of more than 20kts blew steadily over Boao’s King Bay, Hainan, throughout the full day of action at the International Kiteboard Association’s (IKA) course racing world championships. 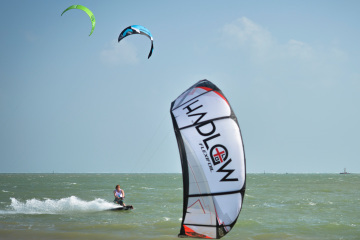 The five-day event to crown new world champions for men and women – who were racing in one 40-strong fleet – is organized and managed locally by Kite Tour Asia (KTA) and the resort of King Bay, which is serving as the main sponsor. Even Johnny Heineken admitted he suffered some a few moments in the conditions but was stoked with his performance, particularly as he found himself racing in a competitive fleet that included the likes of men’s number one seed Riccardo Leccese (ITA), Brian Lake (USA) and Maxime Nocher (FRA). Several of the men’s races had troublesome starts with several tangles downing multiple kites that drew gasps from the Chinese spectators watching the drama unfold. They had lined the beach which was carpeted with hundreds of multi-coloured kites pumped, ready for action. After each of the men’s fleets completed four races Jhon Mora (CAY) was fifth in the overall standings, followed by Wilson Veloso (BRA), Oliver Bridge (GBR) and Tomek Janiak (POL). In the women’s fleet Bridge’s mother, Steph Bridge (GBR) gave Erika Heineken a run for her money but was forced to follow her across the finish line in each of their three races, with the American’s speed and near flawless performance giving her an unbeatable advantage. The young Russian kiter Elena Kalinina was also obliged to trail in Heineken’s wake, but was delighted to finish the day third in the overall standings.